Is your family ready for a monstrously good Halloween? Mike and Sulley want to make sure your home is fully monsterized with Sulley’s Spooky Smoothie recipe, a Mike Wazowski pumpkin carving template, candy totes that are a scream to make and the spookiest window decorations on the block! Take a FREE Class With Craftsy: Sewing, Quilting, Cake Decorating, Bag Making, and More! 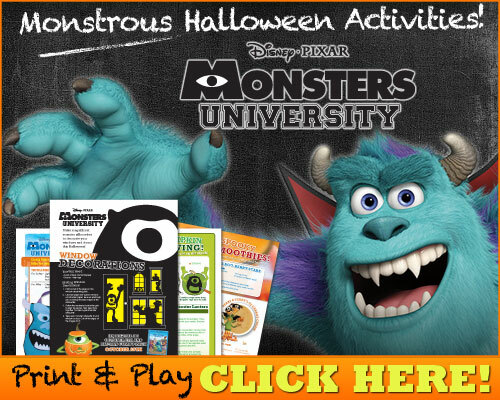 Those are great activities especially for Halloween.My grandchildren Love Monsters University. The monsters are taking over. What fun and festive pumpkin carving and window clings. After carving the pumpkin, relaxing with Sullys Spooky smoothie sounds great! Haven’t seen the movie but I ant to. I enjoyed the first one. The Monsters are still going at my house. My little granddaughter loves these. Thanks for putting them on the site!